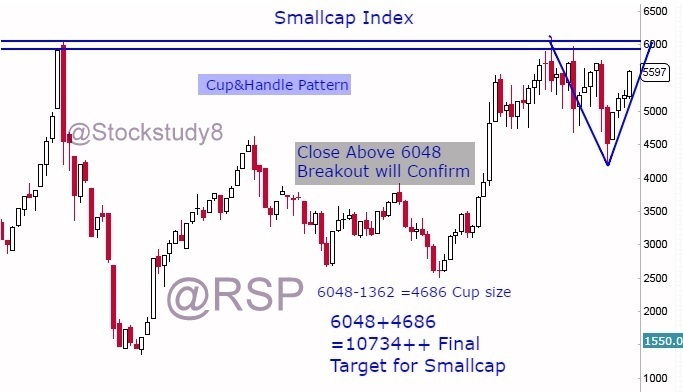 Technical View by RSP: Small-cap Index: Stay Invested for 10700+ & My suggestion for Retail Trader. 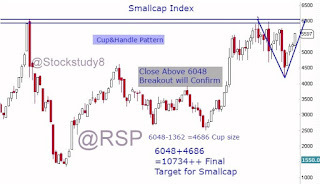 Small-cap Index: Stay Invested for 10700+ & My suggestion for Retail Trader. 1.Small-Cap Index is the only index that Not crossed 2008 High yet.It means lot of steam are left in this index. 2. Check What happen to other index like Nifty,banknifty, Midcal, IT. when 2008 High crossed. 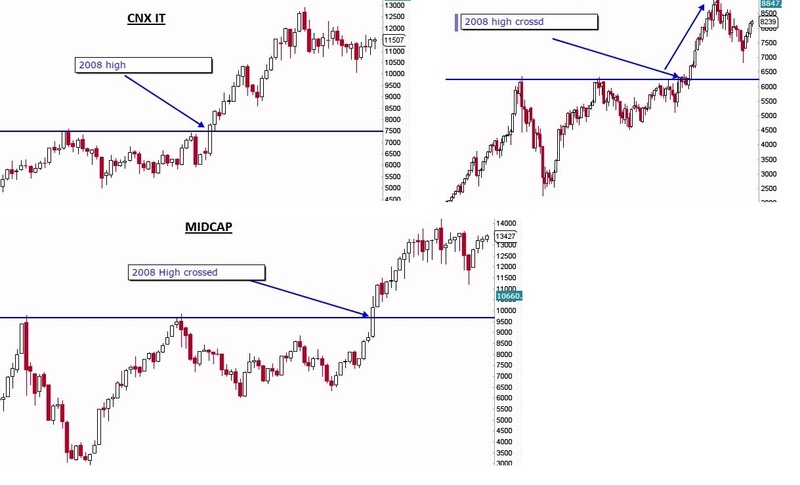 Check Below Chart , What-happen when Nifty, Mid-cap, IT Index Breaks 2008 High. a clear #Rally. Its not a Magic.. Its Called Technical Long-term Breakout . 3.Currently Clear Cup&Handle Formation is going on. 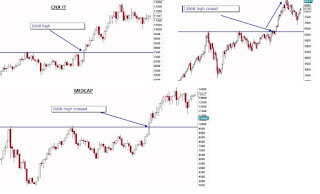 Cup&Handle Pattern is Continuation pattern. It means in coming days market will Break that Barrier. 5.Technical Target is size of cup i.e 4686 point. 4.So my Point is Stay Invested in SmallCap Index for good return in coming year. If u cant pick a good stock in small-cap. Go for Small-cap Mutual-fund. & Take the benefit for Power of compounding. specially for young upcoming beginner in market. if u invest 4000 per month for 20 years ,at Rate of return of 19%(assuming by taking Past performance of Fund) then your total invested amount 960000 become 1 Cr. this is nothing but a Power of Compounding. For the Experts it might see as baby steps or fun. So the experts please forgive. this message for beginner, retail trader who struggling to make money here. lost 5-10 lac without knowledge in no time. last , Im not a mutual fund broker or stock market broker.. so pls dont contact me or im not advertising for myself. Except account opening, Any help needed , im happy to help. Technical Analysis That Works !! !